A big part of the reason we’ve put together a Grand Genesis dental implants practice is to boost your confidence and improve your life. As hard as everyone tries to look after their original natural set of teeth, unforeseen accidents and disease can compromise your beautiful smile but we are here to help. Why not let us find and replace a decayed tooth that’s outlived its usefulness with one of our dental anchors that looks great and will last for years when it’s capped off with the right dental implant? These are the perfect solution that look just like your natural tooth and allow you to eat all the foods that you enjoy. 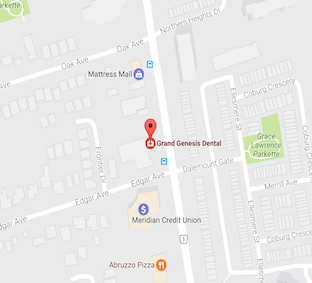 The Grand Genesis dental implants that we provide for our Richmond Hill patients are better than a variety of other techniques available. For example, dentures are a good option when there’s nothing else available but they can be a little uncomfortable. Food can get caught under these appliances and bridges as well. Creating one of our Grand Genesis bridges is another option but it’s important to keep in mind our experienced dentists will need to shave adjacent teeth down which can leave them susceptible for cavities in the future. The best confidence booster that covers all the bases is of course one of our Grand Genesis dental implants. We have experienced dental professionals who can walk you through the entire procedure and answer any and all of your questions to your satisfaction. Our dental facility in Richmond Hill also has state of the art digital x-ray equipment that lessens the radiation you’re exposed to and gives us a clear picture of the areas where we will need to work. Keep in mind that missing teeth can cause bone loss that will prematurely age your face. With these dental implants in Grand Genesis services, healing time is faster and treatment time is shorter than with other techniques. Your face looks more natural when you take advantage of dental implants and you’ll be able to chew and speak properly. Implants are useful in a variety of other ways. They stimulate the jawbone so it can remain healthy and they can even be used as anchors for a crown or part of a bridge. Those are just a few of the reasons that our Grand Genesis dental implants are the confidence boosters that can give you your good smile back again. ADDRESS: 9080 Yonge St. Unit #10 & #11 Richmond Hill, ON. Copyright 2017. Grand Genesis Dental - All Rights Reserved.